Looking to add a little flare to your nano aquarium with a really distinct looking and newly captive bred fish? 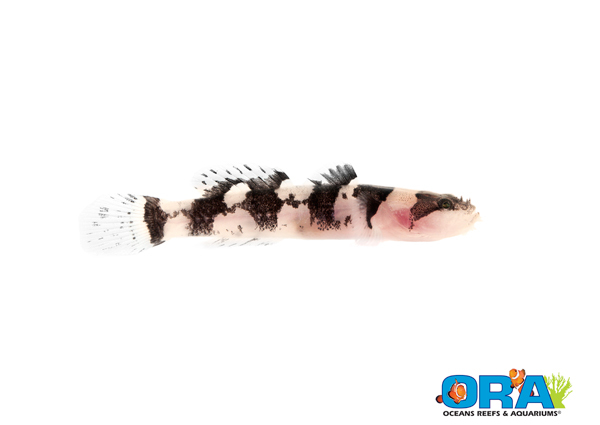 Well, look no further than the Jaguar Goby, the newest addition to the growing offering of Oceans Reefs & Aquariums (ORA). Announced just moments ago on their blog, this goby looks remarkably different that those typically offered in the aquarium hobby. Being relatively new to the trade, the jaguar goby stands out with its white body that is adorned with five distinct dark bands. Helping to give the fish an even more unique appearance is the presence of flared nasal pores, which give it a scruffy look. If this goby is right up your alley, there’s good news, as the fish is officially available to purchase as of today. This fish was originally purchased from Japan under the proposed genus, Astrabe, but the ever curious minds at ORA wanted a more concrete identification. They continued to breed the fish, but in the meantime, they sent off samples to Naomi Delventhal at the University of Manitoba for a proper identification. Surprisingly, the results came back as a totally different species. Naomi determined that the fish weren’t even from the Astrabe genus, but were from the species Gobiopsis quinquecincta. Regardless of the ID, this nifty little fish is sure to add something different to your aquarium, though they don’t do well with conspecifics.